Sarah McChesney might be Prince Rupert’s biggest fan, but it’s only because the community has always been hers. The Charles Hays Secondary School (CHSS) graduate seems to know everybody in this town. Whether she is manning the cash table at a basketball game or helping at a volleyball tournament, she has a big smile and friendly greeting for anyone she crosses paths with, and it’s these same people who helped her heal when she received the worst news of her life. Although McChesney is now in Kamloops, studying at Thompson Rivers University (TRU) to become a history teacher, the swimmer still bleeds Rainmakers’ colours, whether that is the former green and gold or current blue and green. “You play for your town, you play for your community and people who have worn the Rainmaker jersey before you,” she said beside the pool she spent countless hours swimming for the past 14 years. McChesney, now 20-years-old, started swimming when she was six-years-old. By the time she was in high school, she was swimming nine times a week. It has always been her favourite sport. “You pick something that you love and you just stick with it. Swimming was my love,” she said. No matter what sport you play, it’s hard to find motivation to stay disciplined. That’s especially true in swimming, where McChesney had to get up at 5:30 a.m. most mornings. Her kick-in-the-pants was Chris Street, coach of the Prince Rupert Amateur Swim Club. Street motivated her to keep going even when she wanted to walk out the door. McChesney said he is a big part of her success. Over the years, she has collected many medals, best times and awards at regional meets, provincial and national championships. But her biggest highlight was when she went undefeated in the region for approximately two years. “I won every single race for two years. That was pretty cool and I didn’t really know about it until my coach told me,” she said. Another highlight she relays is from Grade 11. She made a bet that Street had to shave off his trademark beard when the first girl in the region broke a minute in the 100 freestyle. So McChesney did it and the coach went clean-shaven, just a week before he had to shoot his passport photos. Fast forward to 2014, and McChesney signed with the Thompson Rivers Wolfpack, and in the process became the first female to commit to the swim team. After swimming at TRU for one year — an experience she thoroughly enjoyed — McChesney hurt her shoulder swimming in May 2015. At the time, she mistakenly swam through the pain. So she started the process of identifying the problem, a process that included bone scans, acupuncture and seeing a chiropractor. McChesney made the decision to stay in Rupert instead of returning to TRU that fall and she took online courses, while helping Street at the swimming pool. Finally in May, the swimmer received the results she dreaded — she couldn’t swim anymore. The news hit McChesney hard — harder than anything. “I didn’t want to go to the grocery store for a long time because you just don’t want to talk to people. I was so emotional and sensitive to everything. I didn’t know why it was happening to me,” she said. Her injury was the hardest thing she’s gone through, to go from swimming twice a day to not at all. Another hit was that she never got to walk away like she wanted to. Her last race was a breaststroke in Prince George. “I’m not a breaststroker by any means so that was the last thing that I got to do in this sport. That’s not how I wanted to go out,” she said. But she’s come to accept what’s happened to her, and a lot of that is thanks to the people in the city she speaks so highly of. “I couldn’t have gotten through that without the teachers and the coaches or my parents. It was a really hard four months,” McChesney said. She had surgery on Nov. 4 and has been healing nicely since. Although her career in the pool is over, McChesney has set her sights on coaching. She’s currently working on getting her Level 2 coaching for swimming. On top of helping Street coach, she also helped coach the CHSS junior girls volleyball and senior girls basketball teams while she was back home last year. Coaching is a way for her to give back to the community that gave her so much. “There’s not enough words and thanks that I could give this community. Every chocolate-covered-almond box that you bought, every bottle drive you supported, it’s just so fantastic to live in Prince Rupert. I do want to coach and give back with that,” she said. McChesney returned to TRU in September and is staying a part of the Wolfpack swim team as well, even though she can’t be in the pool anymore. 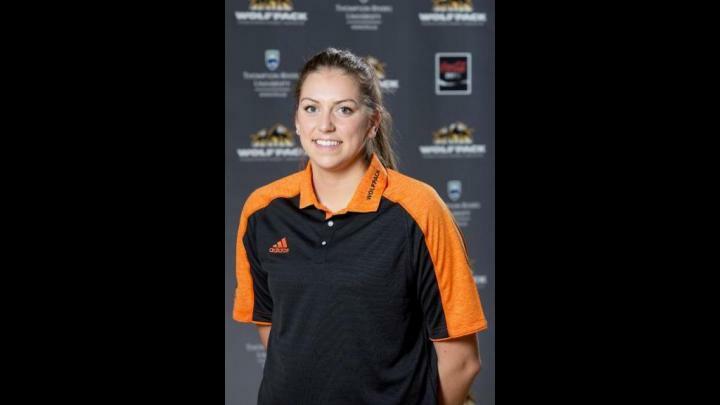 She is an assistant coach for the Wolfpack these days, which only adds to the coach training she plans to put to use when she returns to Prince Rupert once she graduates. And she will return, because there’s no place she would rather be.